Located in a beautiful valley in the south of the Maresme Mountains, this home was designed to capture the magnificent views of the coastal mountain range, which is home to pine and holm oak forests. 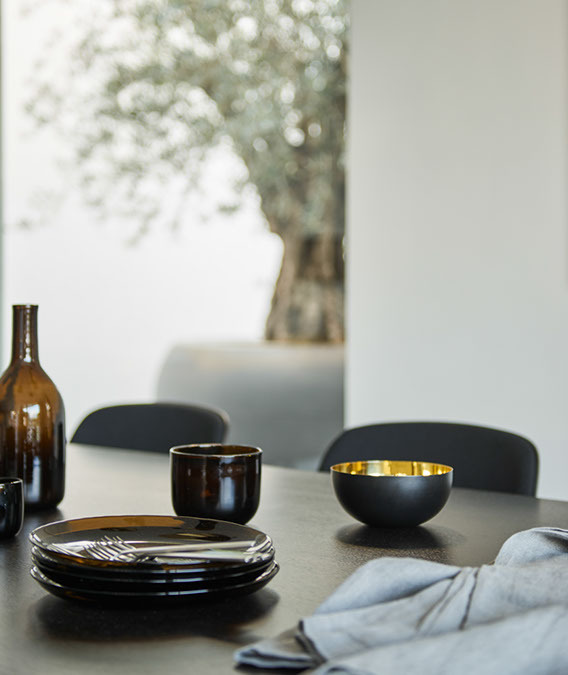 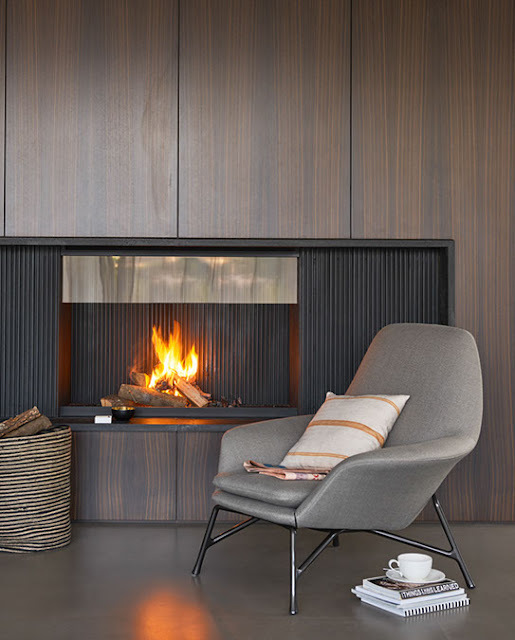 The clients, a Scandinavian family, wanted to create a dream holiday home with accommodations for their kids and guests: a unique, warm and comfortable contemporary space that would host an inviting and harmonious atmosphere. 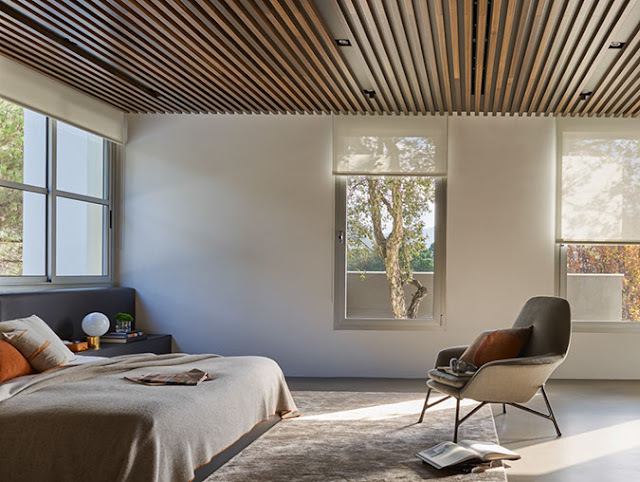 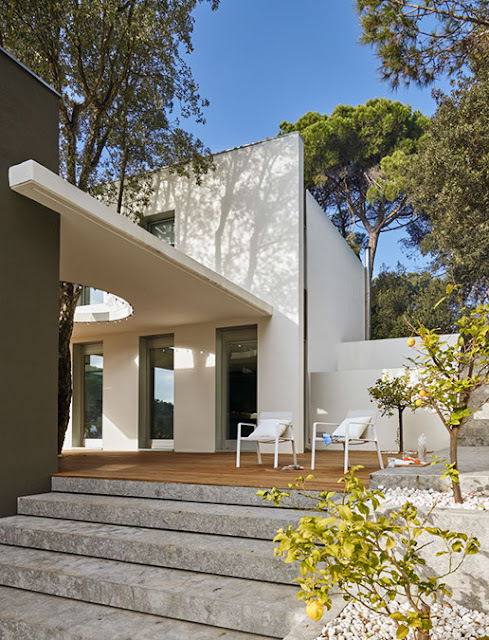 The family commissioned YLAB to rehabilitate the existing house including a new design of the facades, outdoor spaces, interior layout and interior design. 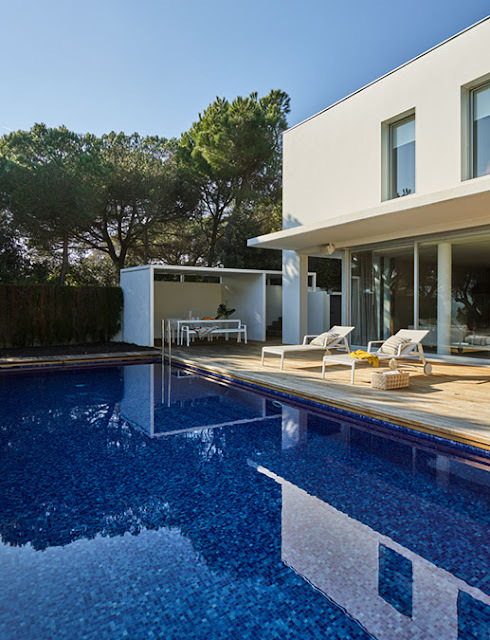 The home was planned as two different volumes connected by a large outdoor space that houses a swimming pool and the front garden. 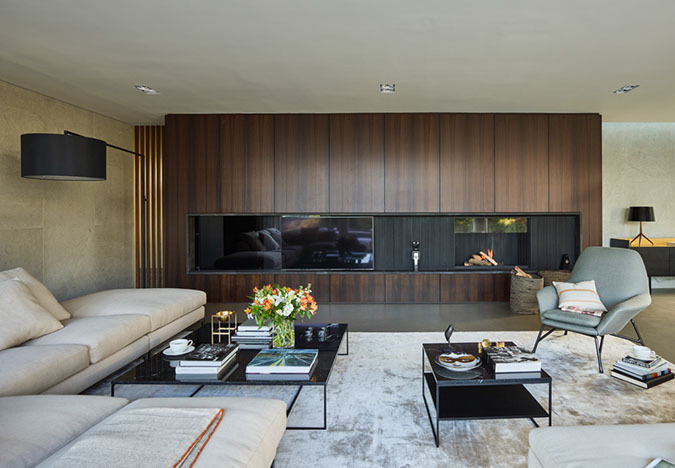 The secondary volume consists of the garage and the guesthouse. 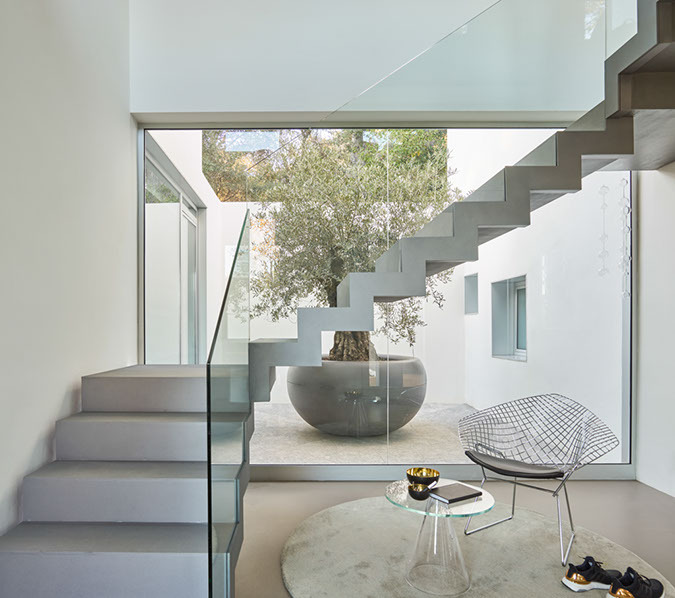 The main volume is spread over two floors and faces the oversized terrace and views. 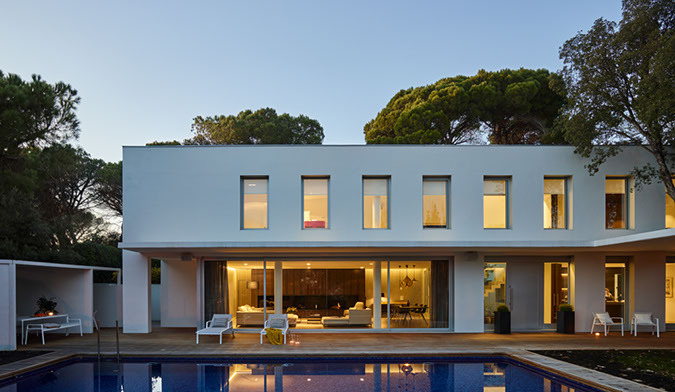 The main house captures the owners desire for luxury and transparency to enjoy the views. 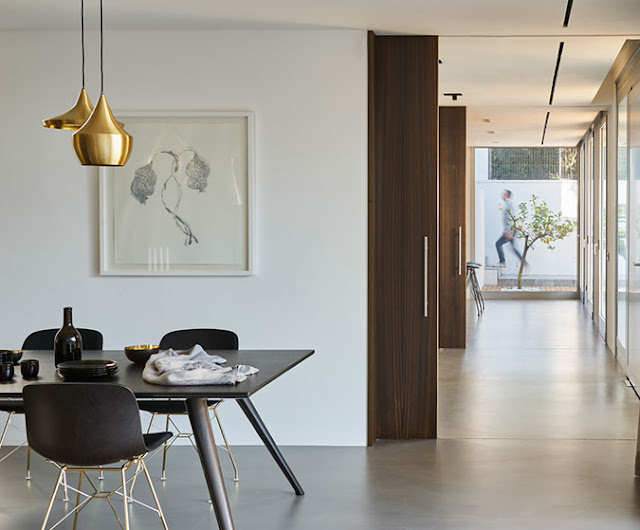 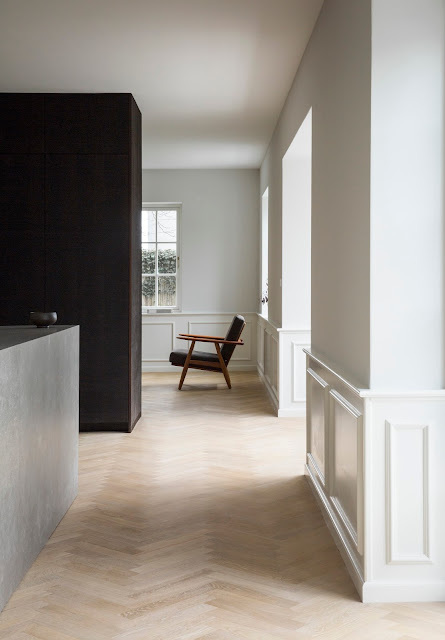 A corridor runs the length of the house on both floors connecting the spaces and giving sight lines through the entire house. Natural light is pulled into the plan via large windows and a central patio. The street level contains the living room with a dining area and kitchen that are separated by an entrance hall with the staircase. 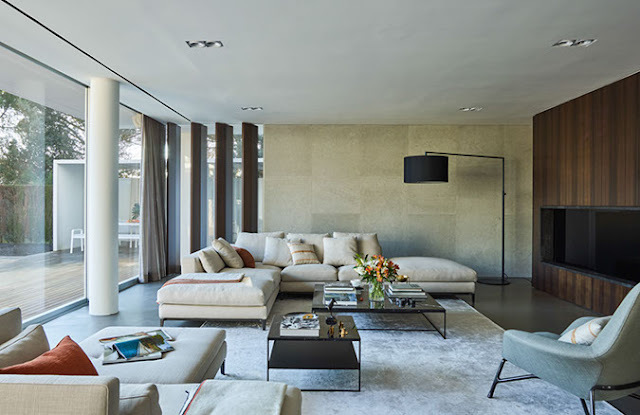 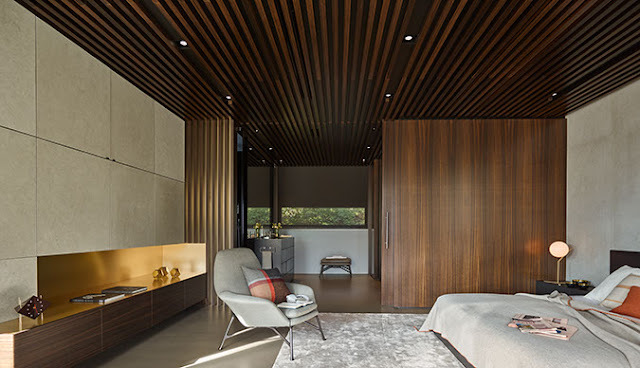 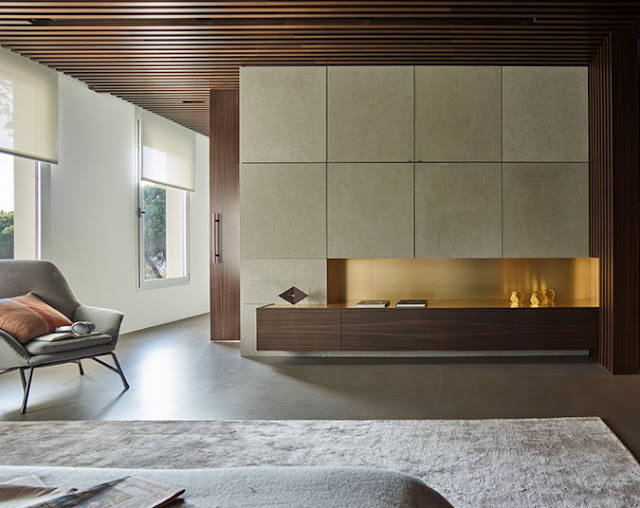 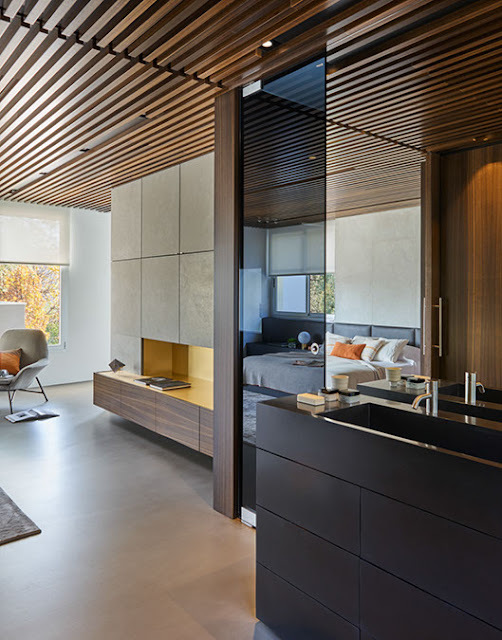 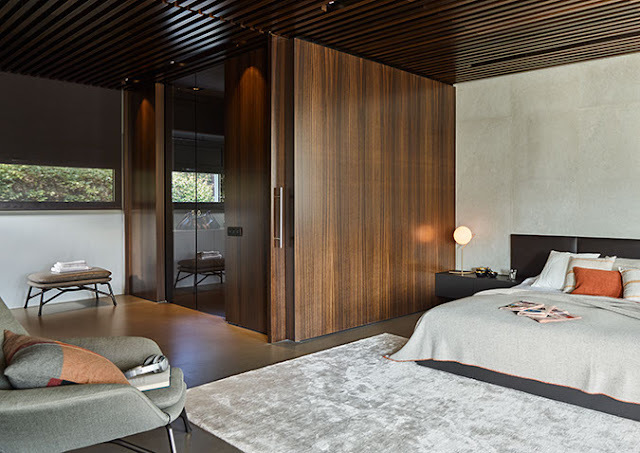 Upstairs, there are three bedrooms for children, a playroom, and a master bedroom.The interior features taupe colored concrete floors, rich tobacco-colored wood paneling and cabinets, sandstone walls and contemporary furnishings resulting in a modern and sophisticated space. 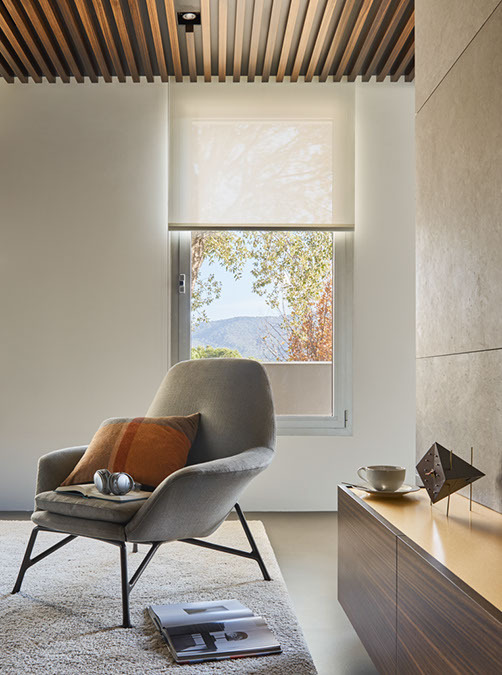 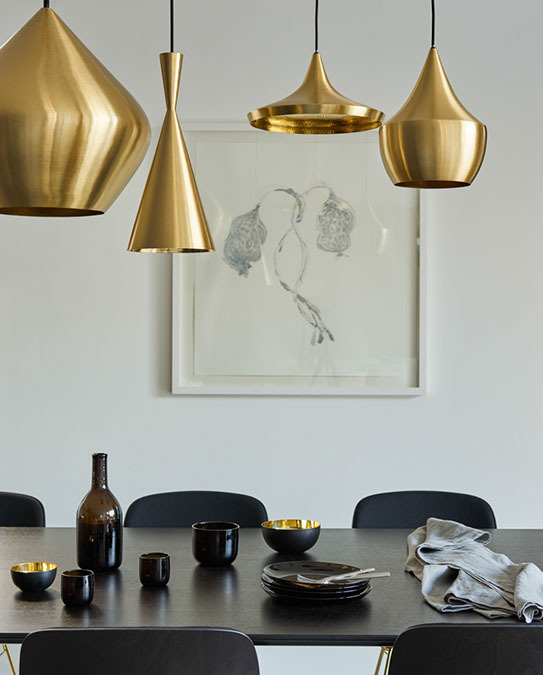 Color is introduced subtly through brass elements, as part of the custom-made furniture and décor, rich fabrics and the landscape views. 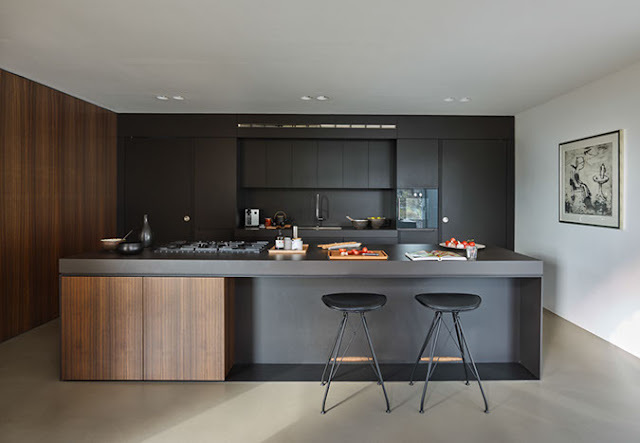 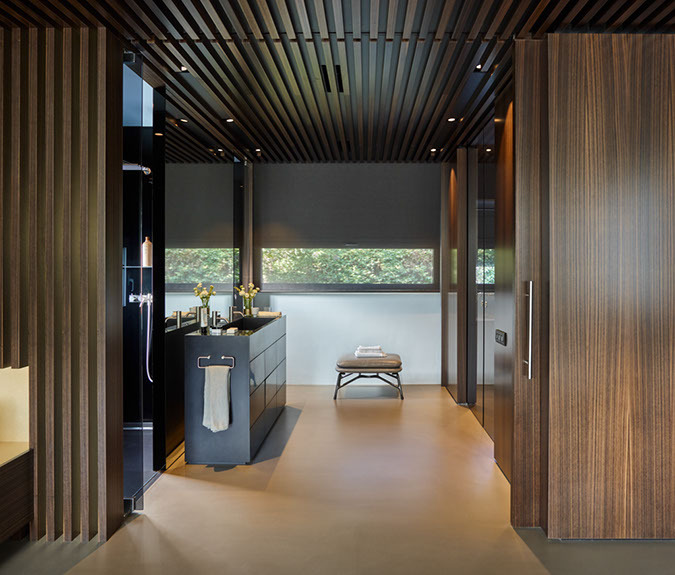 In the kitchen, a central unit with two side sliding doors, separates the kitchen from the rear located kitchen auxiliary areas. 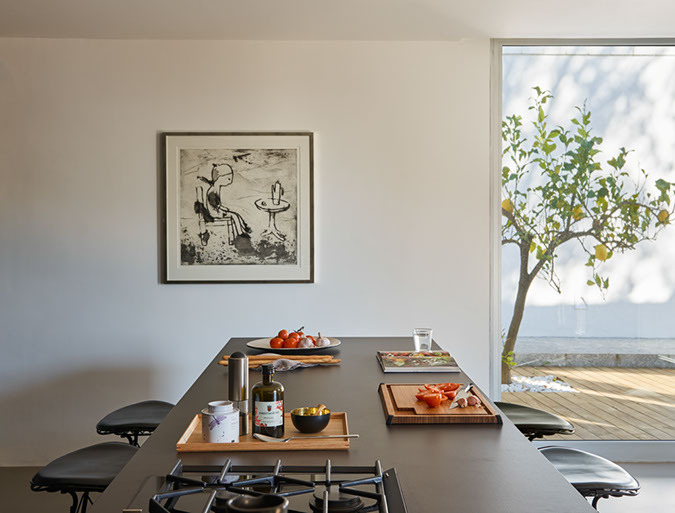 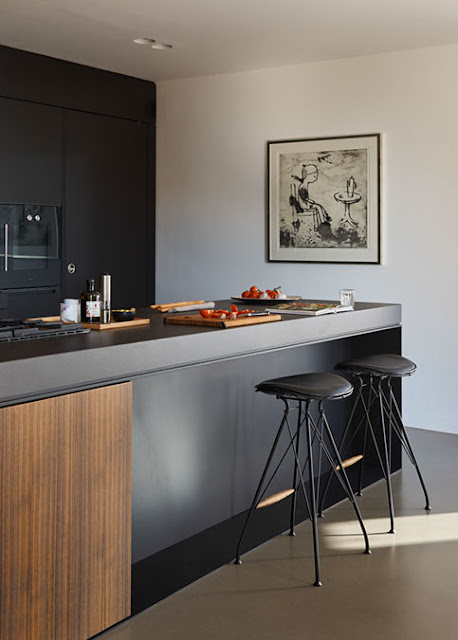 A large central island contains a cooktop and serves as an informal dining space. 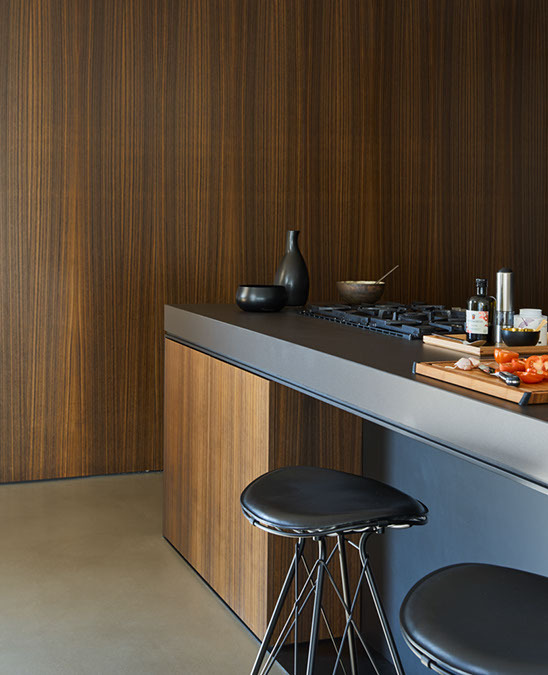 The bespoke kitchen is finished in a dark coffee lacquer finished with a Neolith worktop and backsplash in the same color. The master suite contains a dark coffee lacquered custom-made bed with leather headboard, brass side lamps and a silk rug that become the room’s major element. 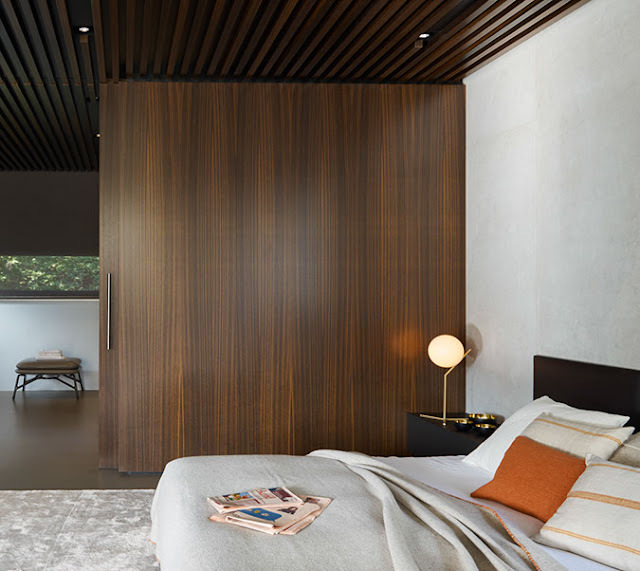 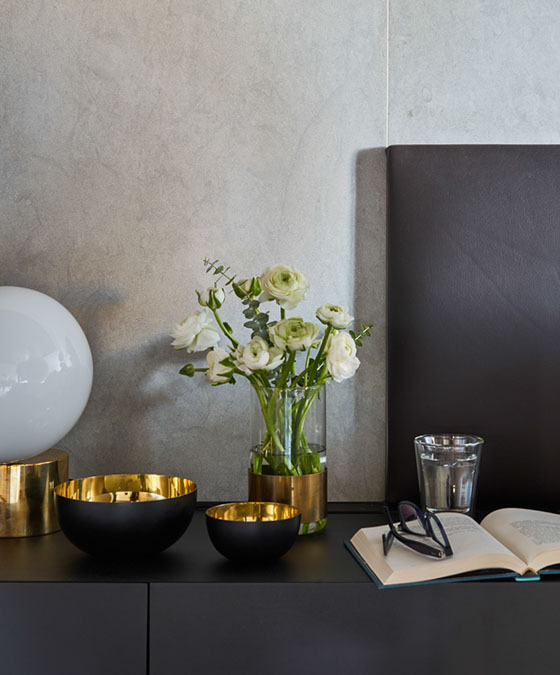 On the wall opposite the bed, there’s a grey sandstone paneled wall unit with a cut-out clad in brass and wood drawers, which hides the tv and storage space.